Best Men's Omega 3 Fish Oil Supplement. Pharmaceutical-grade. Countless medical studies indicate that omega 3 fatty acids are indispensable to maintaining men’s health, especially healthy heart and cardiovascular systems. The Omega 3 is a pharmaceutical-grade proprietary formula that provides a maximum strength omega 3 concentration with an optimal ratio of EPA, DHA and DPA. It’s molecularly distilled from fish oil and natural marine lipids to be completely free of PCB and mercury. Take one vitamin tablet twice daily with meals to get and effective combination of vitamins, minerals and trace elements as well as a blend of fruit and vegetable extracts to get a dose of balanced nutrition. Take one tablet of the Advanced Antioxidants twice a day to support the body’s fight against free radicals and help fight the visible signs of aging. Take 2 capsules of Omega 3 daily with meals to help improve and maintain brain function, cardiovascular, joint and muscle health. 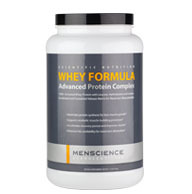 Finally, incorporate 1-2 servings of the Whey Protein to boost protein intake for muscle growth and fat loss. Is this product free of PCB’s, mercury and heavy metals? Each box contains 60 gelcaps, which provides a 30-day supply. Always take supplements with food and water. Because of the high concentration of this product you only need to take two gelcaps per day to get a maximum strength dose of 1,500 mg of Omega 3. Experts recommend you do not exceed a daily dose of 2,000 mg. Yes. As part of the pharmaceutical-grade process the natural marine oils are molecularly distilled to insure complete removal of any traces of other potential substances, resulting in 100% pure EPA/DHA/DPA. As Seen In: Skin Inc. I haven't taken them long enough to measure any lowered bad and elevated good cholesterol yet, but then that's always been my problem. I can't take fish oil pills long enough to produce results because they generally stink and the burping of fish oil is horrible. I even burp the "burpless" drugstore brands. Well, not these Menscience Omega 3 pills. They do not stink, they do not taste foul and I do not burp them at all. I'll post an updated review when I get my next quarterly cholesterol tests back, but for now, I'm satisfied with the product because I can at least take them without side effects. You can see and feel the improvment! I normally don't write reviews but I felt this product was worth telling everyone about. I've taken many other Omega 3/fish oil type products in the past and never really noticed a difference. However, with the Omega 3 supplement from Men’s Science, I actually could see and feel a difference. Since taking this supplement I've noticed that my skin looked great and felt better. My skin feels hydrated and it’s softer. I also had improvements in my eyes. I used to have dry eyes and now it seems that the dry eyes are gone. More impressive is that this stuff worked on me while I’ve been in a dry, arid, and dusty environment. I have been recommending this to friends and I would certainly recommend it to you if you're considering it. I've been using them for several years and these supplements have contributed significantly in lowering my cholesterol. I started buying them based on a review of several brands and these were rated best in terms of purity. I've taken them for granted. My wife was recently told to start taking fish oil supplements and bought some from a drugstore chain-she had all the side effects you hear about. The supplements themselves even smelled terrible. She switched to mine from Men's Science and all the side effects went away. They cost a little more but are worth it. Try them. I asked my doctor about this supplement and he said it was the highest purity of omega 3 he had seen. I started taking this product over 6 months ago and now take 2 pills everyday and feel fantastic. Every man should take enough omega 3 and this is the best way to take the highest purity fish oil. I’ve read a lot about the importance of omega 3 and EFAs and finally started taking these after a lot of research, the menscience omegas are the only ones I could find that guarantee the purity and the concentration, and are considered pharma grade. 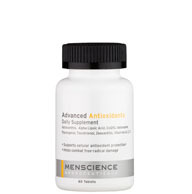 I think the menscience supplements are the best ones in the market. 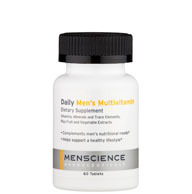 I would recommend almost every product in the MenScience line... except this one. Don't get me wrong, it is actually an excellent product (which is why I didn't just give it one star). The thing is that it is too pricey for me although autoship brings the price down. If you are particularly loyal to the MenScience brand (and I CAN see why you would be!) it is still definitely a high-quality product, molecular distillation being the gold standard for Omega-3s, and focusing on the right ones. The ratio of Omega 3s to 6s in our diet should typically be between 1:1 and 1:4, but the typical modern American diet is closer to 1:30, and 9 is NOT an essential fatty acid (ie your body can make it, whereas 3's and 6's must be obtained from external sources) so the Omega 3-6-9 products on the market are a waste! And many Omega-3 formulations are largely comprised of ALA (α-Linolenic acid) which is a very cheap, abundant, and most importantly weak and ineffective Omega-3, so it's important to know what you're buying. A good product will generally omit ALA altogether. This Omega-3 formulation focuses on the BEST Omega-3s, EPA and DHA, DPA is decent too, and is an intermediary between the two, but is not particularly vital and the dose is quite low anyways. There are 3 supplements that just about EVERYONE can benefit from taking, and a good Omega-3 formulation is one of them, along with vitamin D (D3 in particular) and a bioavailable, chelated form of magnesium (glycinate, taurinate, etc). Consult a doctor if you have a medical condition. *** Daily Values Based on a 2000 Calories Diet. Other Ingredients: peppermint or lemon extract, gelatin (softgel), glycerin, purified water. 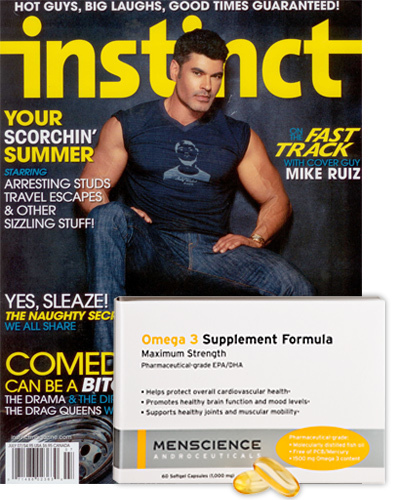 MenScience Omega 3 Supplement Formula provides the highest concentration and highest purity omega 3 essential fatty acids available. Two daily capsules provide over 1,500 mgs of pharmaceutical-grade omega 3 molecularly distilled from cold-water fish oil and in an ideal ratio of EPA and DHA for men’s needs. Countless medical studies indicate that omega 3 fatty acids are indispensable to maintaining men’s health, especially healthy heart and cardiovascular systems. Omega 3’s also assists in promoting healthy brain function, controlling mood levels and supporting healthy joints and muscular mobility.